Kiss Your Old Bench-Press Max Goodbye! If you're still using last year's weight on chest day, you're in dire need of some new methods to pack on size and strength. Here are 4 worth working into your bench-press game. Go ahead, glance around the gym. Think you don't have anything in common with the powerlifter over at the squat rack doing heavy sets, or the competitive bodybuilder pushing past muscle failure in his chest training? Think again. Each of these athletes faces the same stubborn roadblocks you do, none of which is worse than hitting—and getting stuck at—a training plateau. Getting stuck at a given weight is among the most challenging circumstances you can encounter in the gym. You could be training with the same poundage for months, and the only things that are going up are your sense of frustration and blood pressure. What separates the successful from the unsuccessful is their response to the challenge of moving up to the next level. Never is this truer than with the bench press, a flagship that my bodybuilders and others equate with overall success. Remember, our muscles are like babies. Every new form of stimulus excites them in a different way—only not for very long. The change of stimulus could be a different grip type, a new pulling angle, or a different piece of equipment doing the same movement. Change is essential. 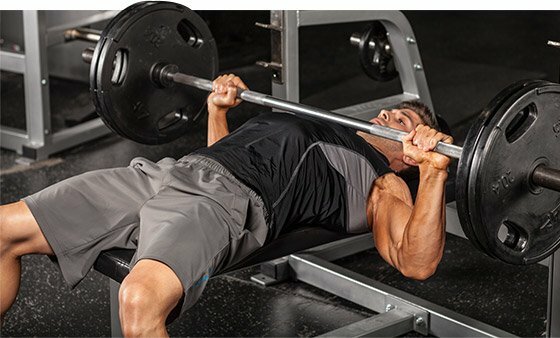 So put down the baby rattle, get under the bar, and use these techniques to bench more weight. Clustering, whereby repetitions are interspersed with short rest periods, is an old-time classic. Although there are a limited number of scientific papers published on this training method, I can tell you from experience that few things work better to make you strong. Clusters sets have been suggested as a means to delay fatigue by replenishing energy stores, allowing for higher power outputs to be performed for each repetition.1 This method can lead to improvements in strength-endurance (more reps with eye-popping weight), and may be a superior method for enhancing muscular strength, power, and growth. Cluster sets can lead to improvements in strength-endurance (more reps with eye-popping weight), and may be a superior method for enhancing muscular strength, power, and growth. Start with a weight that's 90-95 percent of your one-repetition maximum (1RM). Get under the bar and do 1-2 repetitions before putting the bar back. This is considered a "microset." After each microset, wait 10-40 seconds and do another. Do this until you've performed 2-4 microsets, or 2-8 total repetitions. Congrats! You have now completed your first "macroset." Take a regular 3- to 5-minute rest and complete as many macrosets as you can (usually around 4) until you can't complete any more. The concept here is that you're prolonging the amount of time you're handling high-intensity weight. Before long, your 1RM will naturally increase. But if you're doing negatives you'd better have an attentive spotter to help you lift the weight on every rep. Or else. Ever notice that with the bar on your chest, your first rep is oftentimes the most difficult? That's because as you lower a weight, elastic energy builds up in the tendons, which is then released through the concentric contraction, increasing power output. Hold the bar at the bottom of the range of motion for several seconds, or allow it to settle on safeties in the power rack, and you eliminate that elastic energy stored within the muscle (also called stretch reflex). You've just made the movement more difficult at the bottom of the rep. Ever notice that with the bar on your chest, your first rep is oftentimes the most difficult? With reverse movements, you're now you're going to train at the lower end of the ROM to increase your strength. Set up pins in the power rack so you can begin your bench with the bar just over your chest and begin each rep pushing from a dead stop from the bottom up (as opposed to the top down). If this reminds you of how deadlifts are done from the floor from a dead stop, you're exactly right. Because the exercise is now initiated without the help of the stretch reflex, it changes the nature of the exercises and recruits yet-untapped motor units into the motion. Momentarily rest the bar on the safeties, or simply hold the barbell in the bottom position for a few seconds. Both eliminate the stretch reflex. Remember, quickly reversing direction at the bottom defeats the purpose because you're trying to make the movement harder—not easier! Increasing rep speed and explosiveness can elevate your strength gains, so training with light weights (about 40 percent of your 1RM) using plyometric movements can help you learn to accelerate the speed of the bar.2,3 The idea here is to perform repetitions faster—specifically the concentric movement. This type of training focuses on power development and will improve how quickly you're able to activate high-threshold muscle fibers. Because this typically requires you to let go of the bar, use either a Smith machine or a unit designed to be done with plyometric training. Do 4-6 sets of 4-5 reps with that light weight. Push as fast as you can. If your bench press stagnates, maybe you should stop bench pressing! For a while, anyway. Every movement pattern has a number of alternative exercises. For the bench, that could mean substituting dumbbells for a barbell, or using a slightly wider or closer grip on the bar. A handful of other exercises worth trying require the same motion as the bench press, yet are very different. Try out these five substitutions for a few weeks. Maintain the same level of intensity, or relative weight, before coming back to the bench press. You'll likely find your max weight has improved. Floor Press: This press shortens the range of motion. By allowing the plates (or elbows, if using dumbbells) to contact the floor, you'll minimize the influence of the stretch reflex. Close-Grip Barbell Bench Press: The close-grip barbell bench press is a bench press with a grip within shoulder width. This helps improve triceps strength, often a weak link in the bench press. JM Press: This is a cross between a medium-grip bench press and a skullcrusher, so it clearly attacks your triceps. Get a feel for this movement before tackling heavy weight. Board Press: A board press is a bench press with a board on your chest that's used to shorten your range of motion (instead of safeties in a power rack). If you're stronger in your chest than in your triceps, a board press can help to shorten the ROM and focus more on the contribution from the triceps. Barbell Guillotine Bench Press: This is another medium-grip bench press (though you can use a wider grip here as well). Instead of lowering the bar to your lower pecs, lower it carefully to a point between your collarbone and Adam's apple. As with any other exercise, you'll experience diminishing returns as you do more bench pressing. You'll have to find new ways to blast through training plateaus. You can minimize those plateaus by incorporating new exercises and techniques into your training. In six weeks, you'll have one more thing in common with those other big guys in the gym. Haff, G. G., Hobbs, R. T., Haff, E. E., Sands, W. A., Pierce, K. C., & Stone, M. H. (2008). Cluster training: a novel method for introducing training program variation. Strength & Conditioning Journal, 30(1), 67-76. Lyttle, A. D., Wilson, G. J., & Ostrowski, K. J. (1996). Enhancing Performance: Maximal Power Versus Combined Weights and Plyometrics Training. The Journal of Strength & Conditioning Research, 10(3), 173-179. De Villarreal, E. S. S., Requena, B., & Newton, R. U. (2010). Does plyometric training improve strength performance? A meta-analysis. Journal of Science and Medicine in Sport, 13(5), 513-522. For many gym goers, the bench press is the most basic measure of a lifter's strength. Here's how to fast-track your bench press gains in just 2 months! Who would you rather learn the bench from: Some random guy in the gym, or an Animal athlete who has put up over 500 pounds in competition? We thought so. Let Dan Green show you the way to unparalleled pressing power! The Six-Week Bench Press Solution! If you want to bench big, you need to bench more—and better. Commit to this six-week powerlifting-style bench specialization program made for bodybuilders, and outgrow that old 1RM for good!